Etiquette dictated that married couples could use two-letter or three-letter monograms representing their family names, often with the two initials entwined. The rules that were applied in the Anglo-Saxon world for individual monograms were established in the second half of the 19th century during the Victorian era. These differ slightly from those adopted on the continent. Traditional: Wife's first name initial, Husband's last name initial (larger), Wife's maiden name initial. Modern: Wife's first name initial, Husband's last name initial (larger), Husband's first name initial. First initial, last name initial (larger), middle initial. Contemporary British royals currently use a two-letter combination monogram with the groom's first initial in front, followed by the bride's first initial. Traditional monogram for married couples, reading the monogram from left to right: Wife's maiden name initial - Husband's last name initial. 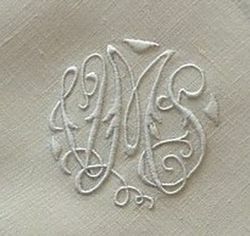 The monogram is the symbol of the marriage of the two families. The continental aristocracy (except in Germany) rarely used three letter monograms as they preferred to use either a crown with their initials below or their coat of arms.